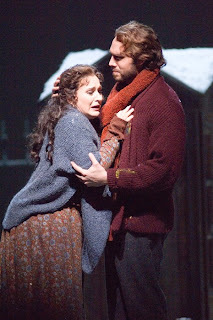 For starters, why do you think La Bohème has this incredible appeal? Why has this opera endured as strongly as it has? I think it’s the music. The music itself tells the story in this incredible way, so much so that first-time operagoers come away going, “Oh, that was amazing, that was unlike anything else.” As for me, I’ve done 6 or 7 different productions of La Bohème, so I know it very well, but I still go to it when I want to relax and just enjoy listening. It’s music that’s easy on your ears, and it sticks in your head and you find you’re still singing it several days later. You also sang Marcello at Seattle Opera in 2007 (although this time you’re in the opening cast). From your perspective, what’s different this time? My voice has changed so much since then! It feels like a completely different role. After all, I was only just out of the Young Artists Program at the time, and I really was still growing. I’ve noticed this with Escamillo, too—each time I come back to it, I am different, my voice has changed. It’s easier, with more experience, to relax into the character better; you have more fun. Yes, I do read reviews—with this production, all the reviews have mentioned our camaraderie. When you have really good, seasoned people doing these roles, they can all relax and have fun with each other and still sing, still be true to the music. Tell me more about how you feel your voice has changed. Everybody is always talking about how Wagner singers have to wait a really long time until their voices are finished. I finally figured out, from personal experience, what that means—it means that your voice is one instrument, top to bottom. The listener doesn’t hear any shifts as you climb up the scale—everything has a consistent, open sound. You hear it with Francesco [Demuro, Todd's Rodolfo]—how does he hold that high C for 8 seconds? Holy cow. It’s a healthy sound, you can hear its longevity. 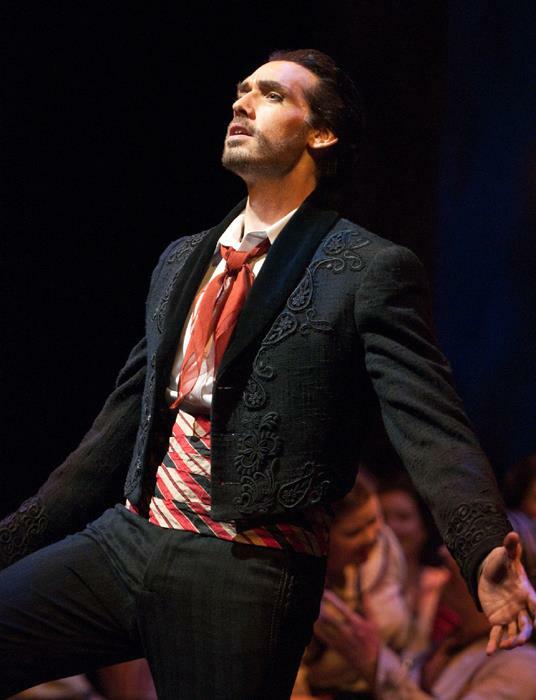 People in Seattle have told me, these last few weeks, “Your voice has grown since you sang Carmen here two years ago.” Technically, when I sang Escamillo then, things were starting to settle, but I think I’ll be even more ready for that role in another couple of years. I don’t think I’ll ever say, “I have mastered the technique of the vocal instrument!” but I’m better at playing with it. You have to be flexible—from night to night you may find you have more energy or less, or the sound is not coming out as you expect. When you’re in your 20s, things are in so much flux that you can’t play. Singers are constantly traveling, switching time zones, gaining and losing weight. And anything that can change, with your body, can wreak havoc with your voice. This Bohème reunites you with Andrew Garland [Schaunard], who was in the YAP with you back in 04/05. Have your paths crossed much since then? No, but we knew each other even before we were both in the program here! In 2002 we both sang in Dead Man Walking in Cincinnati, when John Packard was doing it. 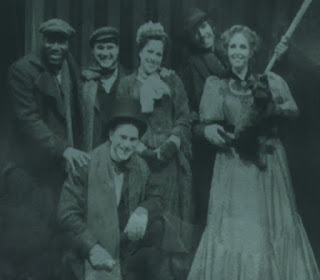 And we did Figaro in school, at Cincinnati Conservatory College of Music—Andy was the Count and I was Figaro, though in another cast. Since YAP I feel like we’ve seen each other here and there, at competitions and stuff like that, but I think this is the first time we’ve actually worked together. How did you become a Seattleite? When I was a Young Artist in Seattle I thought, “I want to live in Seattle but have a foothold in New York.” And after I graduated from the program, I was a nomad for a while, then moved to New York, where I got married. It worked out very nicely—my wife was accepted in grad school in Seattle, and we’ve lived here ever since! The market was good, and at the time I was doing lots of Carmens, we were able to put together a down payment on a house. It was actually Jeffrey Jordan—now Seattle Opera’s Music Assistant, but he also sells real estate for Coldwell Banker Bain—who found us a great place up in Greenwood. Little Miss Stella! Our mini schnauzer. Yes, we got her when we moved out here. She was 8 weeks old, weighed only a pound. I sometimes feel sorry for dogs in New York, whose owners are never home, and they live in tiny little spaces. Stella has been to New York, but she didn’t like it. She’s a Seattle girl through-and-through. How did she come to star in La Bohème? She won the audition by being cute, small, and hypo-allergenic. She has hair, not fur, so she doesn’t make people sneeze. Unfortunately her coat is black, so some people miss her. They’ve given her a big bow, which makes her a little easier to see, but she’s only onstage for a moment. I wish my dog had more time onstage! I suggested she should growl and bark at Marcello. Several, most of which revolve around high notes. I love in the first sing when I sing, “Aspetta: sacrificiam la sedia!” and go to break up the chair for firewood. And of course I love the Act 2 duet. It’s the number one challenge for Marcello, in terms of singing. To sing it beautifully, and the way I think Puccini would want. Sadly, Marcello is a bit of a thankless role—he’s the ultimate “responder.” He responds to everyone, and he has snippets of lyricism here and there, but he doesn’t sing his own aria. No, he’s like Suzuki that way, in Madama Butterfly. Sarah Larsen was our Suzuki last season, and you’ll be sharing the stage with her next year for our Seattle Opera premiere, Menotti’s The Consul. Have you sung this role before? Never sung it before—brand-new to me. I’m excited about it, I think it’s great. Do you sing much contemporary work in English? 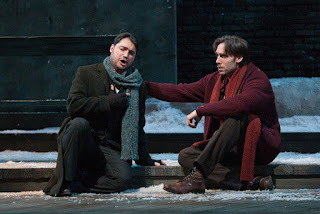 Mostly I’ve done Britten—I covered Nathan Gunn at the Met last spring, in Billy Budd, which was amazing. 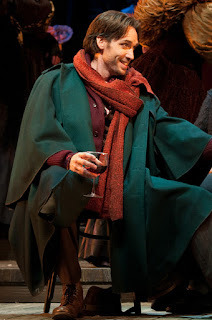 And I’m doing Demetrius in A Midsummer Night’s Dream at the Met next fall, with an exciting young cast. Only six performances, but it should be a blast. I’ve done several recitals of contemporary songs in English. And at Glimmerglass we did The Mines of Sulphur, by Richard Rodney Bennett...you can get the recording of it. Todd is a consummate artist and a good friend. Great to see him doing well! Thanks for the furniture!